Pass the pear cider please! I have the best best best warm and comforting drink that will keep your soul cozy this month. I might be slightly shifting my love of apples to pears (I mean, they ARE such an underrated fruit this time of year) right now in most predictable Jessica fashion, but I don’t hate it. In fact, freaking out priorities may be shifting to pear cider over apple cider. WHAT. I could not be more excited to develop some recipes for Harry and David this holiday season using their incredible pears. You might remember a few years ago when I went to the Harry and David headquarters and it still ranks up there as one of the best trips I’ve ever taken. To say I’m absolutely enamored with their pears would be a serious understatement. It’s a nostalgic thing for me, of course. (um, hi, what isn’t?!) When I was a kid, my dad would usually get a box of pears or two from people he worked with as a holiday gift. And I remember the first time I had a GOOD pear. You know? Juicy, sweet, not mealy whatsoever? I fell in love. From that moment, my brothers and I basically fought over the fruit that would come each December. As the first born crazy person, I’d plot so I could get the gold wrapped one. It was all that mattered to my tween self. And that was BEFORE instagram existed. So naturally, I knew that the first thing I had to make was pear cider because… up until making this, I had never even tasted homemade pear cider before! New infatuation. Here I am. Hello. First, lets talk about how AMAZING our entire house smelled the day that I made this. I love to make homemade simmering spices during the winter but this was, like, ten times better because we actually got to consume the deliciousness after it simmered on the stove all day. Second, it was out of this world incredible. We’re talking four words: In. Cred. I. Ble. That’s necessary. This was my first thought after tasting the cider: it tastes like winter. WINTER! Which I absolutely loved, and here is why. I’m a seasons freak. I love the shift of spring to summer to fall to winter. I could never live somewhere that didn’t have all four seasons – all four seasons dramatically, that is. I love to eat seasonally and enjoy every moment of what each season brings. And to me, apple cider tastes like fall. It tastes like October. Like bonfires and pumpkin patches and hayrides and days that still might reach 80 degrees. It’s fantastic, but it’s all crunchy leaves and pumpkin spice-like. The pear cider? It reminds me of those moments from Thanksgiving to Christmas. Maybe it’s the cloves or the allspice. Maybe it’s simply the pears. It’s just different enough that it screams Thanksgiving turkey turned into snow and Christmas presents and twinkling lights. It’s warming and spicy but sweet. Hot or cold, turned into syrup, thrown in a cake – it’s a familiar enough taste that you’ll feel super cozy, but has that slight hint of… “these are pears!” And booooy do I love pears. 1 vanilla bean pod, split open. Combine the pears, sugar, cinnamon sticks, whole cloves, vanilla pod and allspice in a large stock pot and cover with water. You want the water to be about 2 inches higher than the pears. Bring the mixture to a boil, reduce it to a simmer and cook for 1 hour uncovered. After 1 hour, you can mash some of the pears (they will just fall apart). Cover the pot and simmer for another 2 hours. After 2 hours, let the mixture cool slightly. Strain it through a fine mesh sieve (I did so twice) to remove the solids. Some of the solids may remain. You can strain it through cheesecloth one more time before serving if desired. Serve hot with cinnamon sticks! Store in a sealed container or jar in the fridge. Give me a cup of this and turn on Love Actually and I’m SET. Wow, I love this! Absolutely perfect/ideal use of pears! I’ve heard such great things about Harry & David pears. I’ve never tried them myself, but I imagine they taste incredible and would be great in this pear cider recipe. oh my gosh! melissa you need to try, they are so delicious. best pears i’ve ever had! This cider sounds incredible! Love the way those big fat pears look! I need to buy some STAT! Oh! This looks so easy. Definitely making this next weekend!! Yes! Pear cider sounds sooo incredible. It’ll definitely be a delicious alternative to the classic apple cider. I can’t wait!!! I have had many versions of apple cider, but this pear cider looks like it will take the cake! Absolutely delicious! Now THAT’S a cider I think I’d love! Pears are the best! What a delicious idea! I think this is the first time ive ever commented on a blog post. I always read your posts because your writing style and stories are always so entertaining! I hadnt even planned on pinning this recipe but the way you said it tasted like winter (and then brought up love actually!) Well i am definately going to be making this come december! Thank for all the great recipes and stories, hope you have a good day! lilly! thank you so, so much. that really means a lot to me. thank you for commenting!! I’m using it now and it’s awesome! I’ve signed up for my account and have been bringing in fat paychecks. For real, my first week I made $302 and the second week I doubled it and then it kinda snowballed to $120 a day.M#1. Pear cider sounds amazing! The pictures look great as well. Nice recipe! Can’t wait to try it! We got my mom Harry & David’s pears for the first time two years ago and they were so juicy and delicious! I’ve also been looking for a good winter cocktail recipe for the holidays and I imagine this + a bit of liquor will give the perfect sweet buzz. On my list to give it a try! My husband made this yesterday and it was delicious! Plus our house smells insanely good now. Looks delicious! Thanks for sharing! Do you have any idea if this could be frozen? I bought Harry and David’s pears for the first time this year. One of the pears in the box was rotted so they ended up sending me two more boxes of the pears. I had more pears than I knew what to do with and I wanted to process them somehow. Well cheers to the writer for this recipe! I followed the recipe with some of my own variations. I used star anise instead of allspice and maple syrup instead of brown sugar and added a touch of whisky to the batch (the alcohol gets cooked out hehe). I also added some apple and orange juice and water for some body and volume to the cider. I found the pear nectar to be too sweet by itself. The turnout was about a gallon and ohhhhhhhh man I am now forever ruined for any other cider. Suuuuuper good. Err aah,,, what you have here is a form of pear juice, it’s not cider. Cider is the juice of a pear, which has been fermented, like wine, or better like champaine. Please consider to take a trip to your; craft beer shelf, in any modern health food grocery, and pick a single “perry” selling for about 3.50. Chill it, and taste it, a true pear cider “perry'” is lovely/ wonderful. I’m afraid you’re not quite right on this one! Don’t forget, there’s a difference between soft cider and hard cider. Hard is fermented drinks, soft is for the kids. Part of the difference lies in whether it’s been cooked. Straight juice, raw, unfiltered, is generally considered “juice” while the soft version of “cider” is heated, cooked down, and many times spiced. It’s also usually served heated, whereas juice is cold. Hard cider is used to denote an alcoholic fermentation process. This is very common terminology in the states and parts of Canada! That’s the terminology being used in this article/recipe. Which! I have just completed and it is absolutely delicious cider. It’s strong, very heavy on the spices, and just the treat to get rid of the pears which have fallen right off the tree. Pick of the pile, so long as I clean out the icky bits, and everything gets a rinse and I get some delicious cider. Thank you so much! Thank you for this delicious recipe it has been a life saver for me. I’m severely allergic to apples, and the fall is a sad time of year for me because I can’t partake in a lot of traditional foods during this time of year due to the apples involved. 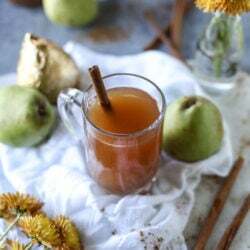 I have successfully been able to substitute pear in for any apple in recipes, but I have always wanted to try a mulled cider, which has been impossible until now. Thank you – I can’t express my appreciation! This looks fantastic!! I can’t wait to make it! Do you know about how much it makes? I made this for a family party in January and it was a big hit, with people wanting the recipe. I didn’t serve any alcohol so I wanted special drinks, and I had this along with vegan Caesar mocktails to choose from, which were both very tasty and fun. You were right about the smell of it cooking being absolutely wonderful. And the taste is out of this world. I just got pears at the co-op, not sure what kind, but would be nice to try these Harry and David pears sometime.